Curtis Calderon is a native Texan and currently tours the US and world with the legendary vocal group, The Four Freshmen. He started his musical career in early high school playing with Tejano groups, an original music formed in central and south Texas. He also appeared on several Tejano records in high school and played the Tejano Music Awards. Always a big fan of jazz, he then moved on to playing with various society and jazz groups in the area. He was a three time member of the Texas All-State jazz band, earning chairs 5th, 3rd and finally 1st his senior year. 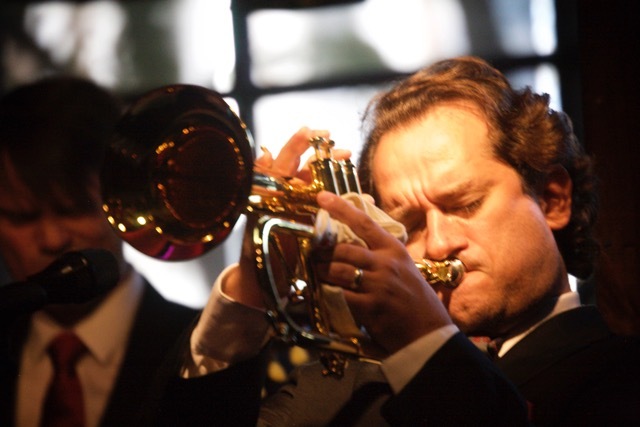 After he graduated high school, he went on to tour with the Russ Morgan Orchestra and Glenn Miller Orchestra, being the featured trumpet soloist in both groups. 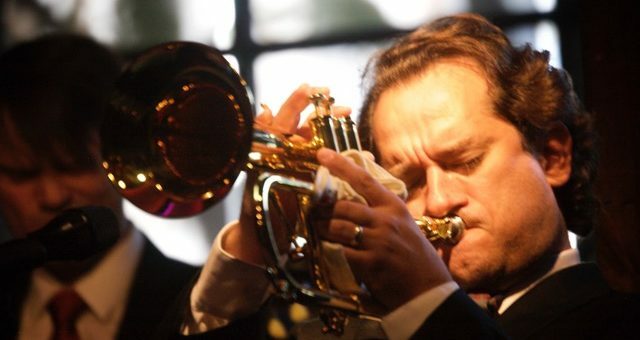 He released several solo projects over the years, including “Only Trust Your Heart”, “Live From The Boardwalk Bistro”, and “Lost Soul: A Tribute to Chet Baker”. Before he joined the Freshmen, he free-lanced in San Antonio, TX playing their annual “Jazz Alive” jazz festival, along with doing one-off tours with Columbia Artists Management, Inc., such as the big band tour celebrating the 100th anniversary of Hoagy Carmichael’s birth and a special tour featuring Maureen McGovern and Joh Pizzarelli, being both a featured trumpet soloist in both groups as well. Around the age of 25 he was called on by the Four Freshmen to audition and has been with them now for 15 years. He sang the lower tenor his first 13 years in the group and now sings the upper baritone part. He is the main featured soloist and currently is the chief arranger for the group’s vocal arrangements. 8 out of the 9 arrangements on their newest record, “Four Freshmen and Friends” are his. Curtis is featured on numerous recordings from big bands to small groups from the central Texas area. He teaches privately and gives clinics when he’s not on tour. You can check out some of his live recordings on youtube or www.CalderonMusic.com.